Matt in the zone during the tutor concert…with Ben Somers. TREVOR HYETT Having been to Sore Fingers three times, and on the eve of your fourth visit, how’s it changed over the 13 or so years since you first came? MATT FLINNER It’s grown quite a bit…maybe doubled in size. When I first came here there was only one mandolin teacher, now there are three! So it’s grown quite a bit. The level of playing has gone up; the students are getting better and better. I was impressed and after the first day I ran out of material…everyone was killing it so quickly! One thing I appreciate about this music camp is that here in England, you kind of have your own take on Blugrass…more of a folk element to it. The scene here really has that certain folksiness to it that I like…uniquely British. But then last night at the student concert, it was certainly more bluegrassy than last time I was here. You still get that sense of people playing folk songs in bluegrass style, but still uniquely British; there seems to be more and more of that real bluegrass feel coming into it, which is pretty cool. TH: I’d be interested in your observations on the make up of the student body now compared to when you first came in 2003; when I first came, a couple of years later, there was a preponderance of older people like me…now it seems there are far more younger and very able players…what’s your observation? MF I remember the first time I was here, there was one very young person in my class, and she was one of the only young ones in the camp and she is now an instructor and great player: Charlotte Carrivick. There seems to be a scene of young kids who all know each other and play together and get together at festivals. It is so good that these young people can get this kind of experience …they don’t have jobs yet, they have time to practice, they don’t have kids yet…they’re really practising a lot, playing together a lot…they have a great camaraderie…this is what they’ll remember when they’re older: these times when they’ve had this camaraderie. I remember feeling that way…you grew up with these people, and you had something special in common. And there are not many kids doing that. The scene here in England is getting good and the next generation will be even better. MF: As a musician you’re just trying to get by. So it’s the day-to-day: booking gigs or teaching, and…I don’t know…I haven’t managed to achieve that balance yet. I always have to come back to why I started to do this in the first place which is because I love to play music. And so if I can get that in every day and maybe get my kids playing a little bit, at least they see what it’s like to do something you love. It seems like for most musicians – maybe everybody these days – it seems like we’re always working to stay afloat and I have to check in all the time and ask: why am I doing this…oh yeah, because I love it. But the balance is tough…it’s hard work. MF: That’s funny! (Laughs – pauses) I’m reminded of a quote from David Grier…we all have those times where we’re struggling to get by and we have to take whatever gigs are put before you…including those cruise ship gigs you mention. On the one hand it’s work, and it can help you keep your chops up, and on the other hand it can be really soul-sucking not playing the music you really want to play, the music that you love. As Grier says: “The main thing is to keep the main thing the main thing” – and that applies whatever it is in life. I’ve been lucky so far. I’m out playing and when I play, I’m lucky enough to play music that I love to play. But it’s a really small audience in general - we’re not playing to big halls. So that’s one reason I teach so that I can do what I want to do. And teaching is something I enjoy doing…I didn’t start playing so that I could teach, but that’s my day job; I’m pretty lucky that I’ve got both. So I can play music…it’s rare…it’s all too common that musicians in Nashville are trying to get a gig in a country band, trying to get on a bus so that we’re playing for $200 a night, or less…but it may not be music we love…I speak for myself, others would love to do that but I’ve never really been drawn to that. So I teach so that I can play music I love to play. MF: The Music du Jour thing is something that my trio…we started doing in 2006 as an experiment to see what would happen if we each had to write a tune on the day of performance…hopefully finish it a couple of hours before we go on stage so we can get in a good rehearsal! I have a hard time finishing tunes, so if I have a deadline, well I work better, and the tunes end up being better than we expected… almost all the time. TH: How many Music du Jour CDs have you brought out now? 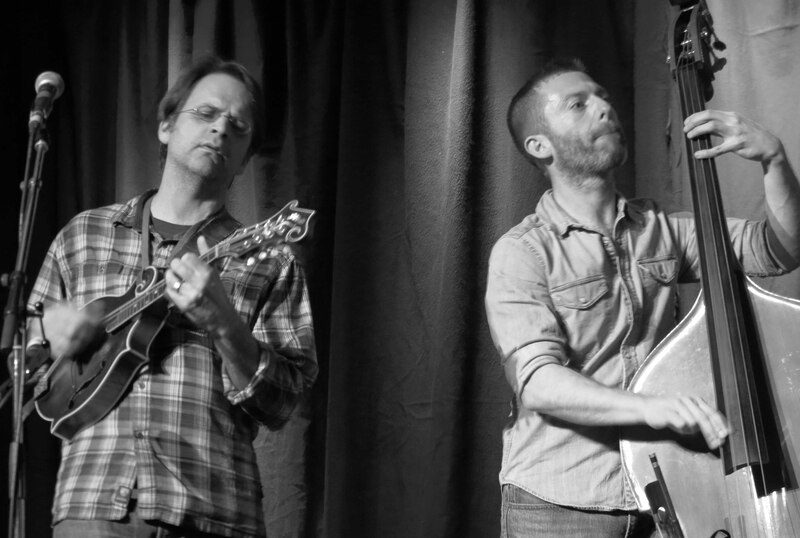 MF: What we’re doing these days is, when we can get it together, is Music du Jour plus guest…so we have to wait for the trio plus guest (to become available)…we did one with Joe (K. Walsh); and others with Sam Bush, Alison Brown, Tony Trischka. TH: Yes…I’d heard that some camps are ‘dry’…How does that work? Matt in a late night session with Ron Block, Joe Newberry, Brittany Haas, Kieran Towers & Jock Tyldsley…and half of the students!